Ever feel like you almost need an extra limb when it comes to the holidays? Wouldn’t it be nice to get a hand when passing treats out to all your costumed visitors this Halloween? Is your kiddo not the biggest fan of carrying his or her treats around in an average candy pail or a worn pillowcase? Well, it’s time to take matters into your own hands. How, you ask? Simply grab this handy Skeleton Loot Scoop! This creepy hand will keep a scary amount of candy safe and sound. The black fabric bag has a bonehead printed on it with a sinister smirk. 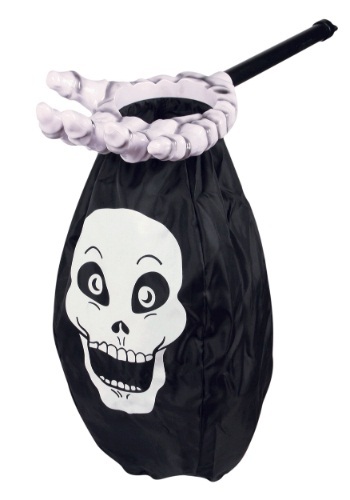 If you use it to pass out goodies to trick-or-treaters, they’ll hope they feel crinkly wrappers behind that smiling skull and not a slimy surprise! If your youngster dresses up as a spooky skeleton this year then this will be a perfect prop to carry around town. Imagine all the time your kiddo will save without having to walk all the way up to every single door in the neighborhood. Who knows, maybe a new world record will be set for fastest trick-or-treater!